I decided I wanted to experience the Lisbon nightlife, so I booked a bed in a hostel and stayed there on Saturday night. It only cost me €12 plus €1 city tax. The alternative would have been to try and get back to Caparica on Sunday morning using public transport. Staying in a hostel was a much better idea. The guy working behind the hostel desk suggested I head for the area around Rossio train station. I took his advice and popped into any pubs that looked interesting I found along the way. When I finally got to Rossio Square, I was a little disappointed because, although the architecture is fantastic, it’s an area I would rather explore by day. That’s me though. I like to go to pubs, not restaurants. I’m nearly always alone. Sitting on your lonesome in a restaurant can be a pretty depressing experience. However, it’s probably a lot different for couples and people who are out with a group of friends. As far as restaurants go, the streets around Rossio square have a lot to offer and even more if you are searching for drug dealers. I have never been pestered by so many people trying to sell me drugs. In the space of 15 minutes, I must have been approached at least 10 times. That sort of thing annoys the hell out of me, I lose my temper fast, and it shows in my voice. So, after saying, “no thank you” a lot and “I don’t do drugs” I progressed to “I don’t do drugs, GO AWAY”. When I visited Porto, I thought the situation with people selling drugs was bad. In Lisbon, it’s 10 times worse. At night, anyway. When I returned during the day I was not bothered at all. It seems that, like cockroaches, the drug dealers in Lisbon are more active at night. As far as Lisbon nightlife goes, there are plenty of options. I think you would have to go clubbing in Lisbon regularly for a number of months to even scratch the surface. Like Amsterdam and outer big cities, there are lots of different areas to explore, and people who like Irish bars will be spoilt for choice. There are at least six of them. 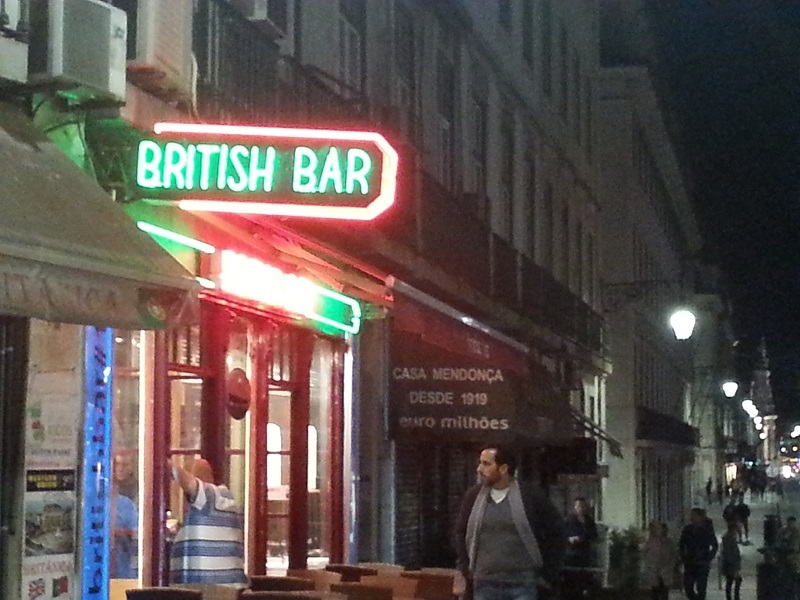 There’s even a British bar in Lisbon. That’s something I’ve never encountered before and anyone who wants to go there should find it easy to find because its called “The British Bar”. It’s not my cup of tea at all, but it seems to get a lot of custom. The area I liked best was Pink Street. It has a lot of good bars there and anyone going to Lisbon for a “lads’ night out” may be interested to learn it has a strip bar. I never went inside, so I can’t vouch for how good it is, but the big, red, neon sign makes it pretty hard to miss. I liked the Liverpool bar. I only planned to stay for a single, small drink but ended up having a few because they were playing Latin music. If a place has Latin music, I generally stay longer. However, when I returned a few hours later, the music had changed, so I didn’t stay long. I also went to Spot Barrio Alto. I love pubs with live music and had found Spot Barrio via Google. It’s a very small place, so it can get a bit cramped and the singers have to do their thing from a spot in the corner, in front of the window. It’s a good atmosphere though and the girl singing on Saturday night sang very well and there was a good audience vibe. As for the price of beer in Lisbon, it can vary a lot and some places charge tourists more than locals. This happens in Caparica as well. I’ve suspected it for a while and a guy I know whose been living here for a year confirms this is so. He warned me about a nightclub called Lux. The locals pay around €10 at the door, but the bouncers ask visitors for €240-€250. I checked the Google reviews. The star rating is high, but the people who award it five stars are locals and local guides. 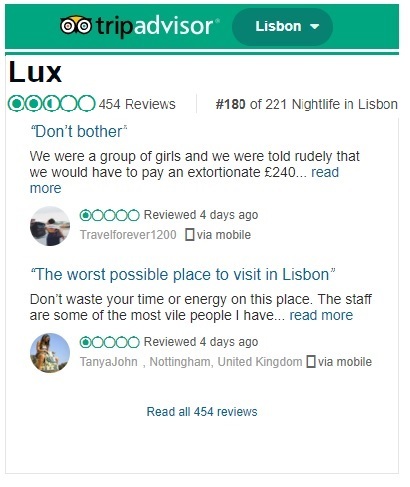 A lot of Americans and other non-Portuguese visitors to Lisbon have posted complaints and the high price at the door appears to happen a lot. TripAdvisor reviews are even worse. I never went there and I don’t plan to go in the future. Getting back to the price of a beer in Lisbon. I paid €1 for a small beer in a bar around the corner from the hostel, and it was the cheapest drink I bought all night. A small beer costs €1.50 in the Liverpool bar and its €2 in the bar next door. It’s also €2 for a small beer in Spot Barrio Alto, but a bar in the same street charged me €3.75 for a small bottle of Sagres (local beer). Overall, I like the bars in Lisbon better than the bars in Seville, but the prices don’t vary so dramatically in Spain and it’s a cheaper night out. The average price for a small beer in Seville is €1 and I know places where I can buy a pint for €1.50 and, thus far in my travels, I’ve never been pestered by drug dealers in Spain. Still, that withstanding, the Lisbon nightlife is good. Most bars appear to shut at 4 am, but the nightclubs are still going strong and someone told me they stay open until around 6 am. There’s more to Lisbon nightlife than bars though. I saw a lot of people sitting at the side of the river and watching the boats sail past. Some of them had bottles of wine, others had beer. The view over the river is very beautiful at night, so it’s easy to see the attraction.